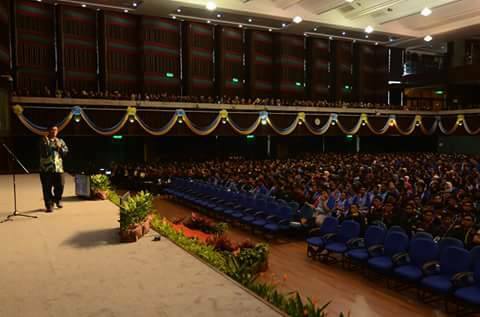 Speaking to 5000 students at Universiti Malaya during their orientation week in 2016. The human brain is built with sensitivity to certain things. Three of the most important are questions, stories and faces. Faces allow us to access empathy. Research shows that infantry have greater willingness to kill the enemy wearing a face-covering helmet than if they could see their facial expressions. When they see a face, the mirror neurons attempt to understand the enemy's emotions and replicate them in the observer. They observe and adapt. This is why, when we speak to a large group of people, our brains get confused by the sea of faces and switches back and forth between what emotion to feel. Why? Because the brain was never built for public speaking. It was built for interpersonal speaking. That's why we are more comfortable speaking one-to-one. Here's the interesting part. Even when you're "public" speaking, you can only ever look at one person at a time. Technically, that's one-to-one speaking. Treat your "public" talk as no more than having a hundred individual conversations and your brain will adapt to one face at a time and reduce your stress and stage fright. Look at one person in the crowd and speak with them one sentence. Send that message to only them. Everyone else listening is only incidental. Then, move on to another person and deliver one sentence and so on and so forth. The trick is to avoid looking at more than one face in one time or scanning from left to right in one quick motion. That confuses the brain as it recognises too many faces and is attempting to adapt to all of them as they pass by. This is why most people tend to look down or away from other people when they are in public places or on the train, to avoid facial recognition overload. Look for the friendly faces first. Switch from one person to another quickly and you will be fine. Later, when you are confident, look for the unfriendly ones. At the end however, when you finish your speech and you finally look at all 1000 as a mass, you might get an anxiety attack. A matter of opinion my dear friend. It has been used widely all over the world. But I sure hope that your honest view on this matter will become a catalyst.